Hair loss is one of the topics that has been repeatedly requested for me to cover. We all know that this is a frequent problem for men but it’s also a frequent and very upsetting problem for women. Why does it happen and more importantly is there anything we can do to stop it? Shabir Daya (pharmacist at Victoria Health) looks at this important issue, explains what is going on and thankfully offers some solutions. It is completely natural to lose hair on a daily basis and on average it is thought that we lose between 50 and 100 hairs on a daily basis. However hair loss can be exacerbated as women approach the menopause with as many as forty percent of women being affected by this concern. When a woman starts to lose hair, it is particularly distressing as a woman’s hair is very much associated with her femininity. There are a number of factors that may be attributed to hair loss during the menopause and beyond and I am briefly going to outline these below. Primarily, the theory of testosterone dominance is the most widely accepted one. A woman naturally produces testosterone which is required for libido and energy as it is normally kept in check by sufficient oestrogen circulating in the bloodstream. As women approach the menopause, and in some cases prior to menopause, levels of oestrogen begin to decline sharply. This results in the dominance of the male hormone testosterone within the bloodstream. This does not mean that they are producing more testosterone, merely that the concentration of this hormone in the bloodstream is higher than normal. Since the body works within very finite levels of hormones, this excessive testosterone is converted into dihydrotestosterone (DHT). When DHT reaches the scalp, it can cause inflammation of the scalp resulting in damage to the hair follicles which ultimately leads to hair loss. This is the most widely accepted theory of menopausal hair loss and scientists estimate that nearly 95% of all cases of hair loss are the result of increased DHT levels in the body. Genetics can cause hair loss in women and this is normally referred to as female pattern baldness. If you have observed hair thinning in your mother or your father has/had a bald patch then the chances are high that you will develop female pattern baldness. All glands communicate with each other using hormones as chemical messengers. During menopause, the production of female hormones by the ovaries declines, which has a direct impact on the thyroid. The thyroid gland secretes thyroxine which helps regulate the body’s metabolism. Any major changes in metabolism can bring on abnormalities including hair loss. Hypothyroidism results in the shutdown of hair follicles leading to thinning hair and hair loss. Certain medications are well known to cause hair loss and these include contraceptive pills, anticoagulants, some antidepressants and some of the medications used to control high blood pressure. Many women are prescribed hormone replacement therapy (HRT) to address some of the common menopausal problems such as hot flushes, night sweats and mood swings. Hormone replacement therapy works to restore oestrogen back to its pre-menopausal levels and is therefore an effective hair loss treatment which in turn reduces testosterone levels and hence DHT allowing hair to grow back. However, there is a lot of controversy about the use of HRT for long periods of time since it is not without side effects. Menopausal hair loss needs to be addressed from both inside and also by way of using the correct topical treatments. In my opinion, a better option than HRT is by way of a natural supplement that has a multi-modal approach to address this type of hair loss: Superior Hair by Food Science of Vermont. This supplement combines well researched ingredients that work to help reduce testosterone levels naturally, and without side effects, in addition to containing nutrients that “feed” the hair follicles. Saw Palmetto Berry Extract – used in Europe extensively to address urinary, prostate and bladder concerns, this extract is well known to inhibit the conversion of testosterone into DHT and it blocks the uptake of DHT into the cells and follicles. This action is very similar to certain drugs used to address hair loss. MethylSuphonylMethane (MSM) – this is a form of sulphur found in many foods. Unfortunately due to its volatility, this compound is easily destroyed by conventional cooking methods. 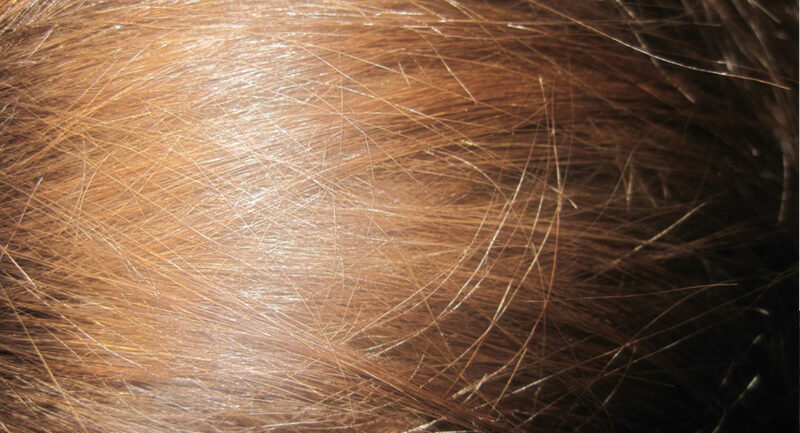 MSM is required for the construction of hair proteins. Proanthocyanidins – derived from grape seeds, these are potent antioxidant compounds that act as smooth muscle relaxants in blood vessels and capillaries. As potent antioxidants, they help to reduce inflammation that damages the hair follicles. Their smooth muscle relaxing properties encourages the flow of blood to the follicles ensuring that the follicles are supplied with vital oxygen and nutrients. Plant sterols – work in tandem with saw palmetto berry to block the formation of DHT which contributes to hair loss. Follicle nourishing nutrients – these include biotin, zinc and copper to name a few, all of these nutrients help to speed up the hair growth rate. Superior Hair is without doubt one of the most comprehensive natural supplements containing scientifically researched ingredients that work in synergy to support the repair of damaged hair follicles as well as helping the healthy growth of hair. Why are topical products important? Whichever supplement you decide to take, it is absolutely imperative that you use the appropriate topical products to address hair loss. This is because many hair care products contain harsh chemicals, which may be damaging to the follicles exacerbating hair loss. Additionally, many of these products also contain resins and silicones that block the follicles starving them of vital oxygen and nutrients, encouraging the shedding of hair. I have no doubt that there are some good hair care products on the market that address hair loss however there is one particular range that stands alone in its field, Phylia de M.
What is so special about Phylia de M range of products? An utterly unique hair care line, Phylia de M hair care products are derived from the philosophy of ancient Aztec and Mayan herbal remedies combined with modern science to create potent, safe and innovative products to encourage the body’s own ability to renew cells and restore keratin, the building block of hair proteins. Fulvic Acid – provides nutrients to the scalp and nerves while removing excess toxins. It transports vital keratin to cells and ensures that they work to their full potential. Tannic acid blend – when a plant is damaged, it secretes tannic acid to repair and renew. Phylia de M use a tannic acid blend to encourage this process. Aloe Blend – a powerful antioxidant blend, aloe rehabilitates cell damage and assists in the production of keratin, the hair protein. For those of you who have not heard of fulvic acid, this is a compound with an incredible ability to carry around 60 times its own weight in minerals, enzymes and vitamins. It also has the ability to detoxify and heal the body when taken internally as well as when used topically. Fulvic Acid will be the next ‘big buzz’ in the health industry, so It is important to note at this point that Phylia de M use customised Pure Raw Organic Humic-Free Fulvic Acid, whilst emerging fulvic acid products are actually humic acid containing trace amounts of fulvic acid. The difference is monumental. To conclude, the best way of addressing hair loss is by combining oral and topical treatments. Superior Hair is an excellent oral supplement that works from within whilst Phylia de M manufacture the best topical treatments. I also believe that it is vital to address hair loss immediately in order to slow or even reverse the process and to help protect the existing hair. Thanks for sharing this informative and helpful post with us. I really appreciate it. Actually, I just want to try them first. I used many shampoos and irony get best result my hair becomes lifeless and growing fast and breaks easily. Can you please provide me with one free sample so I can be sure it good for me? I wish I had samples of products to hand out but I’m afraid I don’t. You would need to approach the company directly.